A CALL TO ACTION: Visiting Fellow at Princeton University Van Jones, who is also a former advisor on green jobs and innovation to the Obama Administration, delivered the keynote lecture at the Universitys annual Martin Luther King Day celebration. He called on students to use their technological savvy and powers of innovation to pose solutions to global concerns like climate change and unsustainable energy usage. A new study of the Princeton Fire Department, the first one to be conducted in over 20 years, will shed light on the operation and efficiency of each of the three fire companies. It is slated to provide recommendations as to cost savings, restructuring, and maintaining a vibrant volunteer firefighting force. 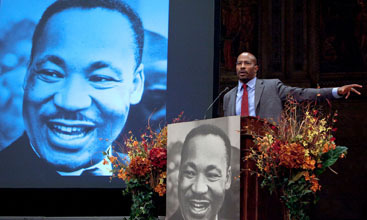 Van Jones, former advisor to the Obama Administration on green jobs and innovation who is currently a visiting fellow at Princeton University, delivered the keynote address at the Martin Luther King Day Celebration in Richardson Auditorium on Monday. He addressed his talk primarily to students, calling on them to apply themselves to solve the pressing problems facing the world. The original timeline is not shot yet, but were getting closer and closer to that point, said new Recreation Department Executive Director Ben Stentz in the wake of last weeks meeting about pool developments. The exhibition, which runs through July 10, will be on view in the main gallery and in the Milberg Gallery at Firestone Library. Derek Colaizzo knew that the Princeton High boys swimming team faced a key test when it hosted WW/P-S last week. Borough resident Dana Sheridan develops and coordinates programs for children, families, and schools at Princeton University’s Cotsen Children’s Library. She received her PhD in Educational Psychology from the University of Virginia, and while her academic career focused on how children learn in informal, non-school environments (particularly museums), her professional passion has always been the design of dynamic hands-on programs for children.